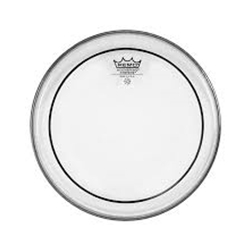 Remo's well-known Clear Pinstripe heads are ideal for delivering the "fat" sounds of rock and pop music. This 8" head is made with two 7mm plys of Mylar film. It also features a layer of a ring reducing agent that is applied between the layers at the outer edge of the trademark stripe. This dampens high frequency overtones and produces a warmer resonance. Pinstripe are very durable and still able to produce a warm tone with a mid-range sustain.